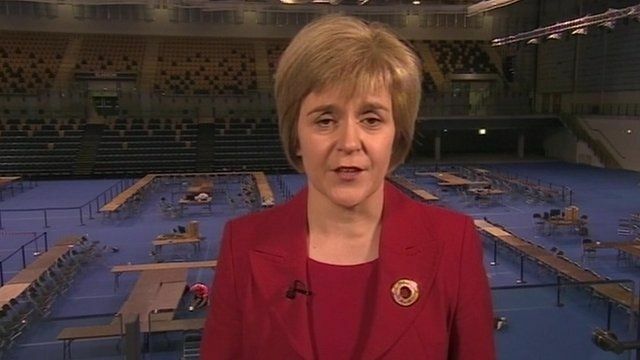 Sturgeon 'deeply disappointed' Jump to media player Nicola Sturgeon says she is "deeply disappointed" by the result of the independence referendum after the BBC forecast a No vote. Glasgow votes Yes to independence Jump to media player Glasgow has given its backing to independence, voting 53.5% Yes to 46.5% No. Falkirk rejects independence Jump to media player Falkirk has rejected independence, voting against it by 53% to 47%. Sturgeon claps West Dunbartonshire count Jump to media player West Dunbartonshire has given its backing to independence, voting 54% to 46% in favour of Yes. The morning after ... a tale of two results Jump to media player As Newsnight's Allegra Stratton reports, a huge political storm is about to blow up, regardless of the referendum result. Fraudulent ballots sought in Glasgow Jump to media player Ten cases of suspected electoral fraud at polling stations in Glasgow are being investigated. Clackmannanshire first to declare Jump to media player Clackmannanshire has declared the first result of the independence referendum. East Lothian backs union in poll Jump to media player East Lothian has rejected independence, voting against it 62% to 38%. Angus rejects independence Jump to media player Angus has voted against independence by 56% to 44%. Midlothian rejects independence Jump to media player Midlothian has voted against independence by 56% to 44%. Dundee gives first Yes victory Jump to media player Dundee has become the first city to back independence, voting 57% to 43% in favour of Yes. Renfrewshire rejects independence Jump to media player Renfrewshire has voted against independence by 53% to 47%. Deputy leader of the SNP Nicola Sturgeon has said she is "deeply disappointed" by the result of the independence referendum after the BBC forecast a No vote. But, she said, voters had sent a message that there was an appetite for change in Scotland and that must now be delivered. She also said that she would work with anyone to deliver that change.